A fastball coming in at 95 MPH lends .400 milliseconds of recognition to the batter. With that, the hitter has roughly 19-feet remaining (approximately 1/3 of the total distance from home-plate to the pitching rubber) before they must make full commitment to the oncoming pitch. Hitting a baseball has long said to be one of the most difficult things to do in all of sports given the sheer numbers and variables associated with the task. So, how do we create consistency (mentally and physically) in a game literally based on impending failure? We have to find our Flow. When a player is in-sync with their rhythm, they are seemingly always working through a centered, balanced and athletic movement. It is at this time the body has a natural way of organizing ones self. I call this your "Flow". The Flow represents the intersect between balance, rhythm and timing, three extremely important elements to hitting both mentally and physically. When we look at the brains ability to dissect information, it was Thomas Bayes and his essay on Solving a Problem in the Doctrine of Chance (1763) that discussed two very key and critical information processing sources: Data (sensory input) and Prior Knowledge (memories and beliefs). In the case of hitting a baseball, the hitter obtains sensory evidence, more specifically the ball coming towards the plate. Taking into consideration that our senses are not 100% accurate and the fact that there are a lot of additional factors in play effecting the baseball we then must make an assumption as to the pitch type and location of the ball. This draws on all of the information that we have gathered through our past experiences and anticipation or approach leading up to that pitch. Given the amount of time and the information we have to process as well as the speed and efficiency of the neurological pathways the information has to travel, we have to assess the likely hood of the baseball ending up where we are anticipating. This does not always go as planned as our window for recognition is so small. With the timing and coordination required to make a decision and the fact that neurologically we are limited by the efficiency and time it takes to "see the ball". So, how do we maximize our bodies response to the information we see and the ability to take our most controlled/aggressive swing? Building a swing based around Your "Flow"
You see, when we are rushed, uncertain or lacking confidence we limit our body's ability to flow. Think about how you are moving during those moments: Hard on the front foot, over-aggressive with the hands, going outside of the strike zone. How you are moving and how you feel you are moving are directly correlated. If I believe I am smooth, I have a tendency to become smooth. If I feel myself balanced and under control, I am likely going to take the best possible version of my swing. A lot of hitters have that backwards. They build a swing that cant get going because of an in-ability to create good flow. They drill and drill mechanics when the answer is more about creating a platform and mindset for your best swing to start. They struggle with starting under control, having body and spatial awareness and are consistently working based on a model of total reps as opposed to quality reps. The best thing about Flow is that it is very evident to those watching. I ask my hitters regularly to "step outside themselves" and evaluate how they are moving by asking the question, "How would you evaluate the way you are moving. How does it look?" And you know what, they typically are spot on each time. This is another visualization technique to get the hitter to think about movement and leads us to believe that we are better assessors of our ability and swing than we give ourselves credit for. And thin of it like this, if we can create an accurate assessment we also have already begun to take the first steps to correcting the issue! This is one of my favorite loading clips of Albert Pujols. Looking at his loading sequence, we can see the early gather in the hands/forearm as well as rear hip. This controlled and centered load is a compression move of his bodies stored energy. Joey Votto creates a similar efficiency in his loading mechanics. Although having a slightly higher leg-lift, his compression move allows for his hands to stay at the center of his body as his lower half begins to fire. This "stretch" allows for a more efficient transfer of energy into the baseball as well as a longer window for recognition. 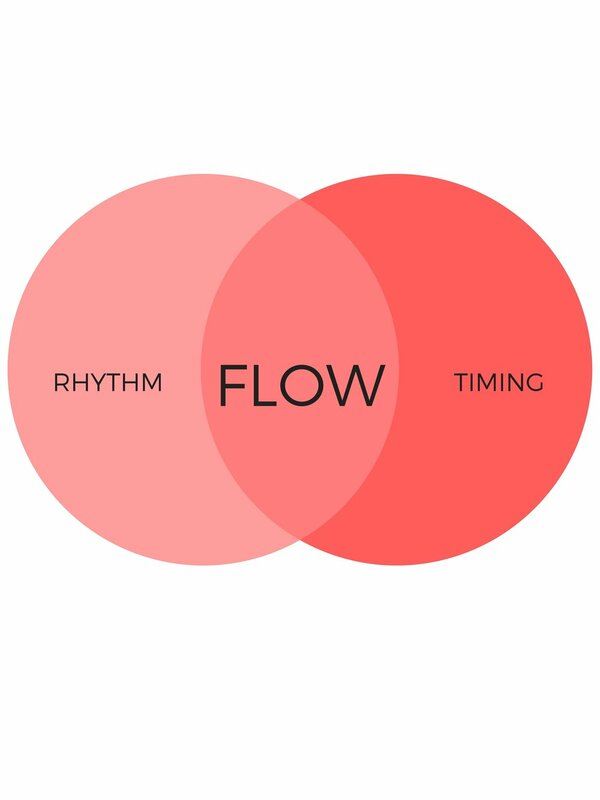 Now that we understand the importance of Flow and the correlation to on-field performance, we can see the mechanical advantages to having quality balance, rhythm and timing. The early loading sequence is a precursors for a controlled approach to see the baseball. With a variety of loading styles, the patterns of elite hitters enable them to work through positions to see the baseball most effectively. A few things to take notice of is how early the hitter prepares themselves to see the baseball. Being "in time" to make a decision on the baseball is an extremely important element to hitting and sometimes gets pushed to the side when evaluating swing mechanics. Simply put, "Is the hitter working through a point to which they can make a good decision on the baseball?" With all of the neurological information that needs to be gathered and the fact that we are essentially making an assumption on pitch type, location, velocity, depth, etc. it is very difficult to imagine a high success rate if we are not in the process of loading early enough. The load is not static, the load is dynamic. Even those hitters that appear to be "still" have a loading mechanic that allows them to control tension in the swing. Loading is fluid in a sense that we need to be able to prepare our swing for commitment and essentially begin our swing early enough and deep enough to make necessary adjustments if we are fooled or off-balanced. When we think of visualizing Flow, the smooth transition from seeing the baseball to swing commitment is evident. The best in the game embody this control and Flow and seek to maximize their bodies ability to coordinate and organize effectively.